Apple’s iWork suit was the best-selling mobile productivity app on any platform, according to Tim Cook, who took the stage a couple minutes ago at Apple’s headquarters in Cupertino during the highly anticipated iPhone event. Keynote is the most powerful presentation program that reached the App Store, alongside Numbers and Pages. Turns out iDevices aren’t just good for consuming content, but also for creating content. And there is iPhoto — which was migrated from Mac OS X to iOS, and became very popular despite being priced at $4.99 — as well as iMovie. The iWork suite (consisting of Pages, Numbers and Keynote) is currently available in the App Store for $9.99 (each app). 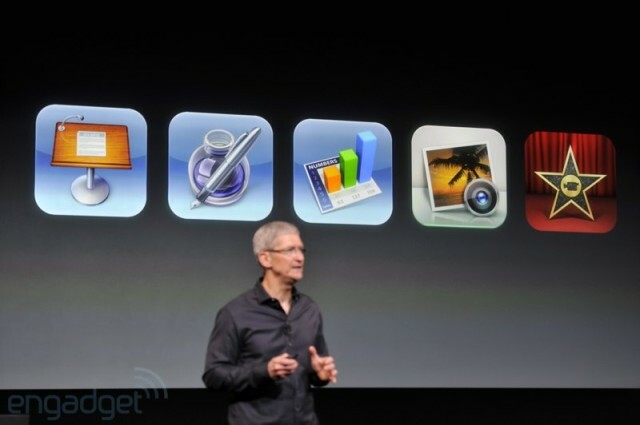 But with iOS 7, Pages, Numbers, Keynote, iPhoto and iMovie will be FREE on all new iOS devices. iOS 7 will present you with a screen that lets you download these apps for free on your new iPad, iPhone or 5th-generation iPod Touch.